For the fifth year, the JazzFestBrno will also host autumn concerts. This year, he invited the American trumpeter and composer Terence Blanchard with the E-Collective group to the Brno premiere. The second concert of the miniseries will be provided by the Cameroonian multi-instrumentalist, but especially bassist and singer Richard Bona with his home band Richard Bona Group. Terence Blanchard will perform on November 23 at the Sono Center, Richard Bona at the same venue two days later. Tickets are available on the jazzfestbrno.cz website and at regular advance sales. 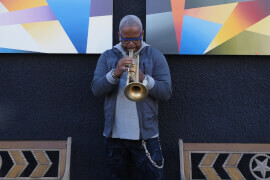 Terence Blanchard, a peer to the well known Bruno Wynton Marsalis, has earned five Grammy Awards during his rich career, two of which are the best jazz instrumental solos. "Blanchard is not only an amazing trumpeter but, above all, a great and stylishly wide-cut composer and arranger. Moreover, it is time. I would not even care to say that at the age of sixty-five he showed the way to the younger generations. His music pulsates with rhythm with roots in New Orleans and is full of colors - sound, harmonic and melodic. Blanchard makes a tremendous comment on political and social events and phenomena and remains 100% contemporary, "says Art Director of the festival Vilém Spilko. Blanchard's name resonates with the film world. He composed music for more than three dozen feature films, and his composer's versatility has been used many times by renowned Hollywood director Spike Lee, among others for the 25th hour starring Edward Norton. For the music of this crime drama, Terence Blanchard was nominated for the Golden Globe. He recorded his last two records with his quintet The E-Collective, with whom he also arrives in Brno to present the recently released Live album. This is the cut of a record of the three performances that the band performed in the United States in places where violence has been escalated between police forces and the black people, specifically The Dakota Club in Minneapolis, The Bop Stop in Cleveland, and Wyly Theater in Dallas. The seven songs that have come from these concerts on CDs are not intended to be a protest song; musicians through them rather want to show the way and provide inspiration to the young generation. E-Collective is characterized by experimental, electronic, and moment-to-exotic sound that reflects today's upscale world. Cameroonian bass wizard Richard Bona last year with his project Mandekan Cubano inspired an audience in the sold out Janacek theater. After less than two years he returns to the Moravian metropolis to show another of his musical faces. The sound of his band is as incomprehensible as Bon's phrasing and energetic bass equilibrium. Bon's father was a singer and percussionist, and his mother singer - Richard Bona - had to meet music since childhood. The talents he was endowed with could successfully develop and the encounter with music became his second nature. His popularity and originality have gradually gained a reputation and today he plays almost exclusively with his own band. "It creates multi-genre music floating in jazz waters. Richard Bona plays bass, bass, percussion, and guitar. She also sings in the Douala or French language, "says Spilka. Bona tries to go against the stream of modern music with his band and for example, his album Bonafied has labeled as an album contradictory to modern trends and showbiz. "More than a half of the hall has been filled during the first two weeks of the Bonus concert tickets sale. Therefore, we recommend to buyers early purchase. We expect it to be sold out last year, "says Vlastimil Trllo, Executive Director of the festival. The high level of the festival is due not only to organizers, but also to faithful fans and partners. The main partner of JazzFest Brno remains the Brno investment group DRFG, whose founder and majority owner is David Rusňák. DRFG's investment group aims to capitalize on equity by investing in equity interests in prospective companies and projects. The group prefers fields well understood by its representatives and locations that are culturally and geographically close to each other. It primarily focuses on investment in real estate, telecommunications and financial services. More on www.drfg.cz .